CARREY - Geographical, statistical, and historical map of Michigan territory. CARREY, H.C. / LEA, I. - Geographical, statistical, and historical map of Michigan territory. Geographical, statistical, and historical map of Michigan territory. - CARREY, H.C. / LEA, I. 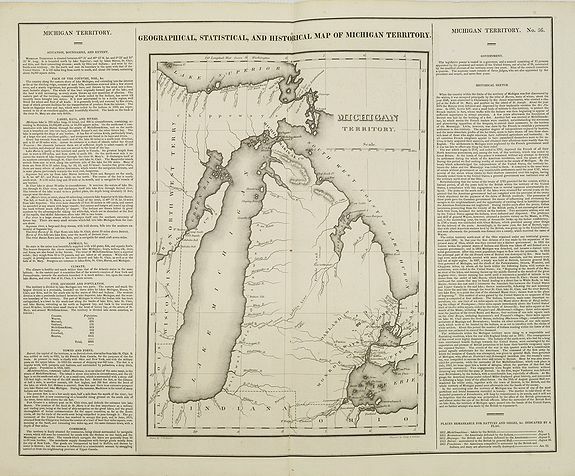 Title : Geographical, statistical, and historical map of Michigan territory..
Map maker : CARREY, H.C. / LEA, I.. Size : 16.4 x 20.3 inches. / 41.7 x 51.5 cm. Description :The first printed map of Michigan Territory. Text around the map describes the Topography, Climate, Animals, Civil Divisions, Population, Towns & Forts, Government, History and remarkable battles fought in Michigan to date. Early roads shown and some settlements on Lake St. Claire and Lake Erie, along with Ft Brown and Camp Smith south of Green Bay. Virtually no settlements in the interior and the upper peninsula, with most of the towns concentrated on the southeast border. The remainder is Indian Territory, with notes on Portages. Includes Indian Settlements, and a few early counties, including Monroe, Oakland, DeWayne and Macomb.